An infinite series of bifurcations, forking paths, choices (to be) made. Every choice made rules out other possibilities. But do we make these choices, or are they made for us? Is there a real choice? 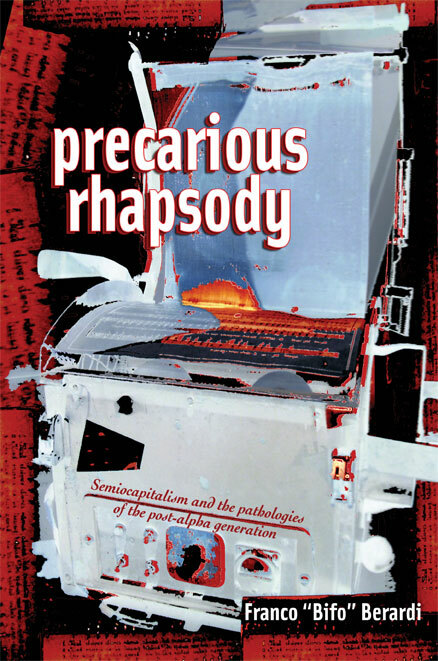 In Precarious Rhapsody, Franco Berardi traces back these chains of bifurcations and unravels the many (psycho)pathologies that accompany them. How have the social, economic and cultural transformations of the last three decades impacted our lives? What are the implications for the digital natives, the post-alpha generations that grow up knowing there is no spoon? This book outlines changes in the capitalist system and the use of media, technology, and culture and the effects of these changes on a range of disciplinary fields; geopolitics, economics, discipline, everyday life and love. A teleological effort to retrace a labyrinth of bifurcations to better understand the present precarious situation of the social psyche. Berardi uses his personal history and involvement in the worker revolts that took place in Bologna in the 1970s to start this philosophical road trip through a multitude of flightlines into the virtual realm of semiocapitalism. He joined the Italian autonomist movement in 1974 and experimented with pirate radio and the use of media for creating autonomous zones through self-organization. Repression of the autonomist movement forced Berardi to move to Paris where he worked with Guattari on the semiotics of schizoanalysis. The author’s political and personal engagement and activist roots resound throughout the entire book and make it an interesting read. The first two chapters and the glossary give a good impression of the arguments Berardi uses to arrive at his post-futurist manifesto. There is a lot of repetition in this book, sometimes literally copy-pasted paragraphs. It helps make clear connections or drive home certain points but it can also feel a bit redundant at times. The first chapter is by far the most optimistic and somewhat nostalgic. The final chapter has a much more dystopian tone and Berardi seems to have abandoned all hope for art or an avant-garde since the events of 9/11. Almost as if the semiotically induced depression has caught up with the author himself. Finally, the manifesto of post-futurism adds some irony and a call for critical media art and activism. The neomarxist framework of the Italian autonomist movement is the starting point for identifying the possible paths for a theory of the media, culture and activism towards the 21st century. What are the affordances of revolutionary movements of the seventies, what can we learn from these organized protests and how do these events relate to class struggle in the digital connective economy? The events of 1977 mark the first bifurcation. Workers from car factories join forces with unemployed youth, students and intellectuals to protest on the streets of Bologna. These self-organizing protests took inspiration from dada, futurism and surrealism instead of old labor party traditions. Language became their site of social struggle, using electronic technology and mass media to create a new mass avant-garde, where poetry meets advertising. Media and capital fuse and give birth to semiocapitalism. Since the informatization of production processes, in the new economy the proletariat has been largely replaced by the cognitariat, the new working class who perform fragmented intellectual labor on immaterial information to produce material and immaterial goods rather than manual labor that produces material products. In this new mode of production, transformational processes have been replaced by processes of elaboration of information. Cognitive labor in the information age is highly fragmented, as is the time dedicated to this labor. Through the dynamics of the Internet the labor is constantly fragmented and recombined; the fractalization of labor. This new form of flexibility transforms the worker into an interchangeable machine connected to a nervous system that supplies semiotic and recombinant fractals of time. We can talk of semiocapitalism when informational technologies make possible a full integration of linguistic labor with capital valorization (2009: 149). This has consequences for the economic as well as the linguistic field. Linguistic labor does not comply with the Marxian law of value. The economy incorporates new factors of semiotic instability and language takes on economic rules of competition and overproduction. The effects of this surplus of signs are not only economic. The effects are also physical, as language acts directly on the psycho-sphere, where elaboration processes on informational stimuli take place. The concepts of cyberspace and cyber-time help us better understand the fractalization of labor time and the disturbing potential effects it has on the social psyche. Cyberspace is by definition infinite and ever-expanding, a virtual space for semiotic agents that has no beginning or end. The amount of stimuli produced by these semiotic agents far exceeds the mental time needed to elaborate on this incoming information. This is cyber-time. Contrary to cyberspace, cyber-time is limited by several factors; organic, cultural and emotional. The brain simply cannot keep up with the mass and the speed with which the information enters it. The bombardment of images and a-signifying signs is amped up to eleven by the Internet. An overkill of electronic stimuli that cause a state of panic that Berardi names electrocution. Excess information has a physical effect, psychosis. This is one of the many psychopathologies the author shows are intertwined with the concatenations that control the imaginary in semiocapitalism. The many pathologies that Berardi identifies are presented in a convincing manner and the examples that are used to illustrate his findings are very recognizable. Here the staccato structure of repetition helps to align the different pathologies. The author offers a diverse mix of philosophy, literature, cinema and popular culture references that enlighten his theoretical position and perspective. For instance, the role different legal and illegal drugs play in strategies of dealing with different psychopathologies that emerge are compelling. Cociane is used to keep up with the speedy flow of stimuli from cyberspace. Heroin shuts the brain off for all incoming stimuli. What are the possible effects of a generation of managers that inhibit their own sense of panic and excitation by taking Prozac? What risks will they take? What if these people run our financial system? After the events of 9/11 Berardi claims that the end of modernity has come. It also entails the end of the artistic avant-garde, the end of political activism, and the end of art. The dystopian imagery the author uses to lament the current state of the arts in semio-capitalism indeed does not paint a particularly pretty picture. It is all rather gloomy, not unlike news broadcasts these days. To claim the end of art or its relevance for society is a statement that does not carry the same conviction as Berardi accounts to the afore mentioned pathologies in this book. Also, as Berardi claims, the most fundamental bifurcation is between machines for liberating desire and mechanisms of control over the imaginary. Although it might seem as if controlling mechanisms overshadow the machines for liberating desire, his post-futurist manifesto tells us that even though there is no future, there is always hope for dangerous love, ironic rebellion and life-changing art in the infinite present.